We have rarely been graced with such a warm, witty and engaging guest poet and we are delighted that Helen has agreed to come back for future events. Thanks very much to poet and workshop leader Gordon Wilson who hosted the monthly poetry cafe on February 1st at Riverhead Coffee while I was out being a woodland warrior. The next cafe event is Thursday March 1st and I am looking forward to it already. Happy New Year to everyone. 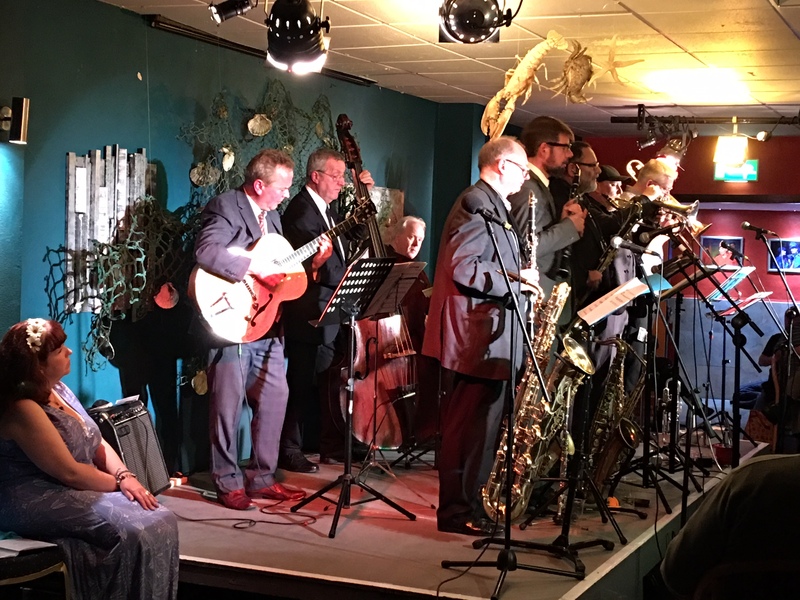 Here’s the link to the broadcast of Fish Tales from the Herts Jazz Festival. It’s available until about 22nd January on the BBC iPlayer. One programmed concert of new music at many a festival these days is the latest suite by Alan Barnes, usually for an all-star octet. This year it’s Fish Tales, music and poems based on the Grimsby fishing industry. I often wonder how precisely thematically based jazz suites relate to their subject matter, but in this case the correspondence between the music and Josie Moon’s words is pretty close, from the rowdy fun of Three Day Millionaires to the street parade sounds of Homecoming, even Dave Green’s bubbling bass solo for The Drowning Man. Moon’s poetry covers the domestic, the documentary and the supernatural, her explanations are clear and her readings dramatic. Alan Barnes’ writing makes particular use of the versatility of his threeman reed section (some lovely writing for two clarinets and bass clarinet) and, with top-class soloists throughout the band, Mark Nightingale and Robert Fowler made a particularly strong impression. It’s beginning to look a lot like Christmas at La Luna HQ and in the world at large. The most unexpected and delightful present I think I’ve ever had is the fact that Fish Tales will be broadcast on Radio 3 on CHRISTMAS DAY at 11.00 pm on the lovely Soweto Kinch’s Jazz Now programme. 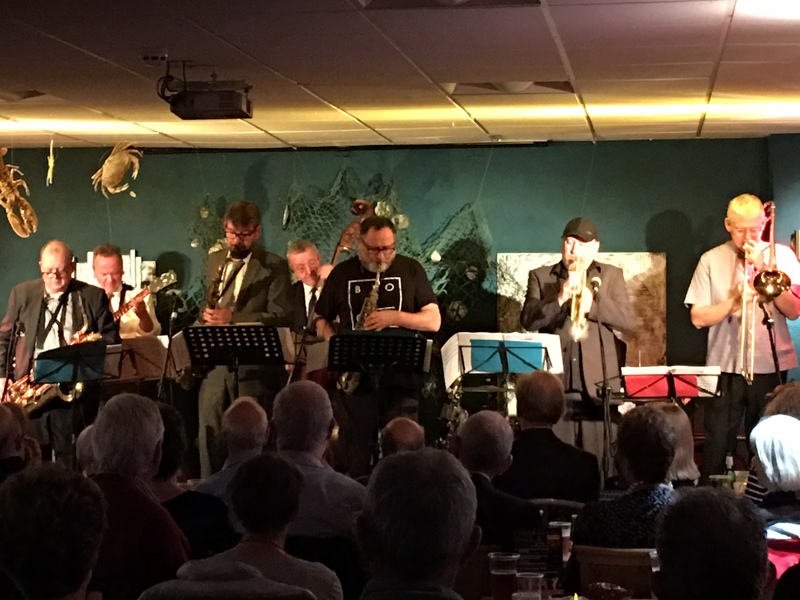 The recording was made at Herts Jazz Festival on a nice October afternoon. I was so glad I was wearing a long, full skirt because my legs shook all the way through the performance – you try not to think about being recorded while you’re being recorded but your unconscious likes to remind you and I was nervous. I know I’ve said it often this year but Fish Tales has been the most extraordinary creative experience, right from the start, from the first inkling of the first poem to the last gig at Shrewsbury. It has been sprinkled with fairy dust throughout. These jazz musicians are spectacular talents, all of them with their ability to dazzle with improvised solos and to come back to a complex score full of subtlety and nuance. Audiences, venues, promoters have all been full of welcome and bon homie and every gig has had its own flavour and its own moments of delight. I do have books available and if anyone would like one, just drop me a line. As it’s Christmas I’ll do two plus P&P for £8 I don’t have many left so get them while they last! watched his ship blow in. knew he could not live without her. The fisherman took her for wife. kissed under the dancing sky. his heart caught fast in her net. tending the babes that came each year. at the transformation of their seal mother. that she was never meant to be. prays to all the Gods, that she will return. called back by the salt that ran in her blood. And so the official tour comes to a glorious finale with a wonderful gig at The Hive in Shrewsbury. It was a special evening after a very special run of gigs. This tour has been an incredible experience for me as a writer and performer. I’ve found a rhythm and a style on stage that I am very comfortable to inhabit. I feel like I’ve found my home now as a performer and it is a very happy one. The warmth and generosity of the musicians has played a big part in me finding my groove. I will miss them all and am already forming plans and ideas, dreams and schemes as to what happens next. So, thank you to everyone who has made this a success and such a joy. But special, heartfelt thanks to my lovely friend, mentor and jazz wizard Gill Wilde. It was Gill who started this and she was there to the last note and the last word. Her energy, commitment and belief in this project have been the special ingredients that have made this work. Gill is stepping back from her role as Mrs Grimsby Jazz and the town will be poorer for it. Gill has given so much time, love and energy to jazz over the years and although she deserves her time in the sun, we will miss her so very much. Folkestone is quite a trek from Grimsby but I have become adept at sleeping in the back of the car or at being in a poet’s coma as my lengthy naps have been described. The Dartford Crossing is an event and I’m glad I was awake for it as the bridge is quite beautiful. The traffic isn’t and the roads are in a lamentable state – but I digress. The welcome at Folkestone Jazz Club was warm indeed. The Tower Theatre is a beautiful space, a lovingly adapted chapel that is inviting and well designed for performances. The octet found themselves up close and personal again after being some distance apart at Herts on Sunday. The vibe was suitably windswept and sea-inspired as a storm was brewing in Folkestone when we took to the stage for what was a barnstorming performance from everyone. Because the stage was small I sat to the side which gave me a new aural experience. I’ve got used to sitting with Mark and hearing a lot of gorgeous, warm brass solos from him and Neil with the visceral delight of Gilad cutting through. I’ve heard lots of drums and bass as well and so it was great to hear more of Alan, Dean and Pat this time. After having my knees knock throughout the set last Sunday, I was pleased to feel enough nervous energy to power my performance but not so much that I feared I might fall over. As the tour has progressed I’ve added more layers of storytelling to my introductions and have grown in confidence. I feel I know the poems so well now and really enjoy inhabiting them as I share them with the audience. The standing ovation at the end brought tears to my eyes and yet again the lovely comments from audience members made my heart swell. I am thrilled that we have more dates in November and yet more next summer. At the moment I feel I could do this forever and never grow tired of it. However, there are stories, poems and ideas bubbling away and we shall see what time brings. Back to life, back to reality, well until Thursday when we hit the road again and head for Folkestone for the last gig of part 2 of the grand Fish Tales Tour. Grand indeed. 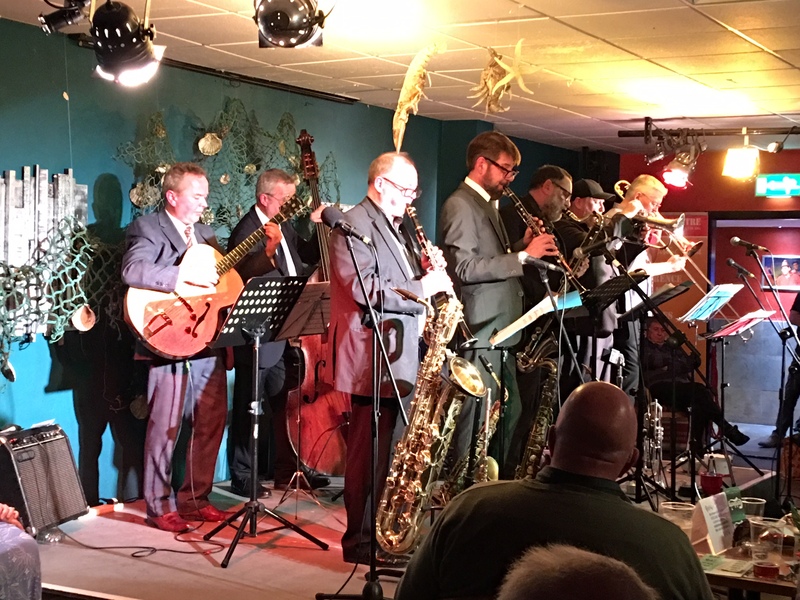 We’ve had nothing but warm welcomes and kind words and I want to say thank you to all the venues and promoters who have hosted the production; Dave at Swansea Jazzland, Steve at Leeds Jazz 7, Chris at Wakefield Jazz and Clark at Herts Jazz Festival. Thank you also to the lovely audiences who have been so rapt and so attentive. It has been a wonderful experience for me to truly feel the impact of my words in the response of the audiences. Many thanks to everyone who has bought the books and CD’s, that is true support and is hugely appreciated. Finally thank you to all the lovely people who I’ve spoken to after gigs who have commented on how much the poetry moved and affected them, how much they enjoyed the show and my delivery. 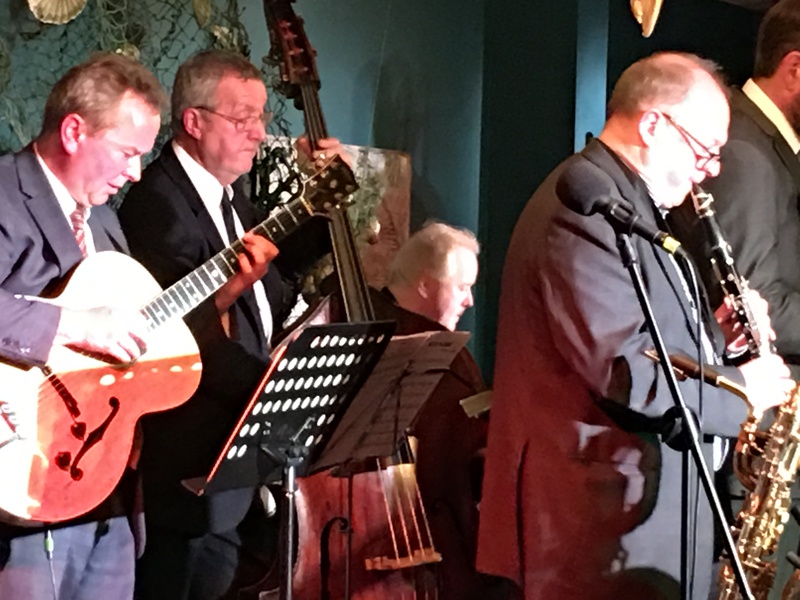 It is such a great joy and such a lot of fun to perform with this stellar cast of jazz legends, all of whom play with energy, fizz and aplomb. I have been dazzled by some of the solos and lost in the tunes as they weave and wander, telling the story through the voices of the instruments. Fish Tales lives and breathes on the stage; it is a complex and beautiful work and I am immensely proud to have been part of its creation and to have the great good fortune to be bringing it to audiences across the country. 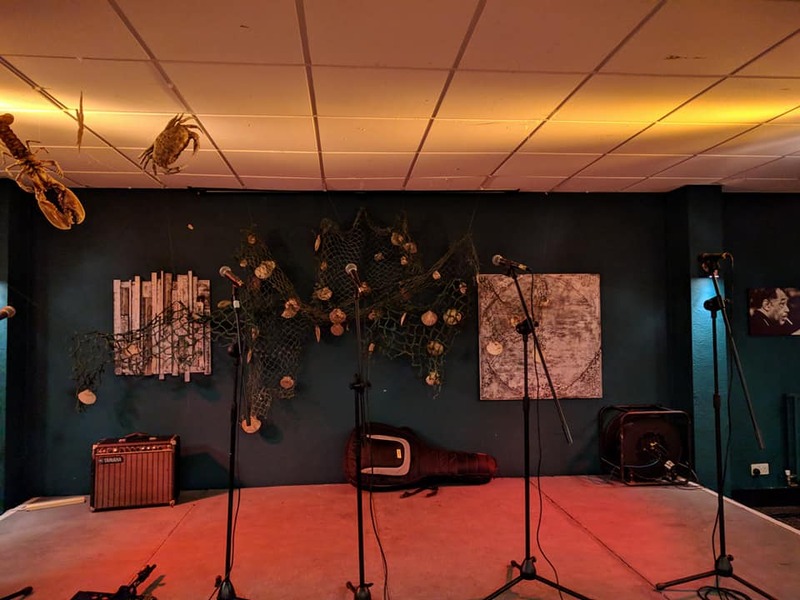 Out on tour, taking the route from the late summer flowers in the garden, all the way to Swansea through beautiful South Wales to a welcoming stage a spit from where Dylan Thomas lived. Then long, bad roads with hold-ups and delays up to Leeds and a glorious gig with added bonus of old friends coming along to say hello after too many years to count. Home for a brief hiatus and then off we go again to Wakefield and Welwyn this weekend. More poetry is needed, I concur. It is only ever a good thing. I can smell autumn coming in and the damp mornings, busy garden spiders and darkening evenings all testify that the season is changing. After a turbulent and painful summer here’s hoping that the autumn brings some peace, calm and gentleness for all souls on this great blue planet. Among the things I am looking forward to is the return of the choir with a fresh start and an independent future which I am pleased to be guiding alongside the supremely talented Jo Townell. The choir has become a central focal point of my life and weekly routine. It is a place of joy and light and sustains me as much as it sustains its members. I am thrilled that the Fish Tale tour begins again in October with dates around the country. Being on the road with such consummate musicians and my great friend and jazz champion Gill Wilde is exciting and fun and I am chomping at the bit to get out there. There are several beautiful, creative projects in the pipeline including two forthcoming La Luna publications and some poetry events and opportunities. I am always grateful that I have so many creative outlets. There have been some very dark days of late and the light that gets in always comes from places of creative energy. Autumn is a good time to reflect and look for a bit of peace and quiet, if not externally then internally. The equinox on the 21st and the returning darkness open a space for that to happen and I will be taking advantage of this time for just that. We all need that quiet and for the noise of life to abate. Peace and kindness to all beings. I had one of those lie-ins this morning. It’s not something I do much these days. I like being up and into the day but this morning I was dead to the world and when I did wake up I had no idea where I was, what day it was or who I was – well, that’s a small exaggeration but I like the power of three. Once I’d re-calibrated myself and found the coffee the world began to resettle and assemble itself in a manageable order. I tuned out the news, it’s all bad, and thought about the past few days, with no small sense of wonder. At the weekend we went to Llandudno. Primarily this was for a gig with the marvellous Alan Barnes Octet. The festival had a magical vibe to it. 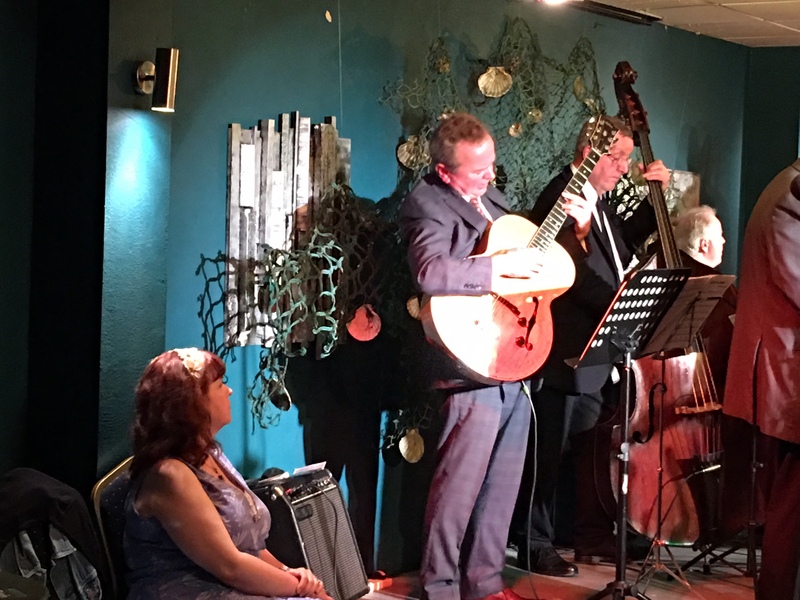 Quirky, welcoming and brim full of exciting and varied jazz, it was a treat for the ears. The beautiful setting, the sea, mountains and sky made it a treat for the soul. 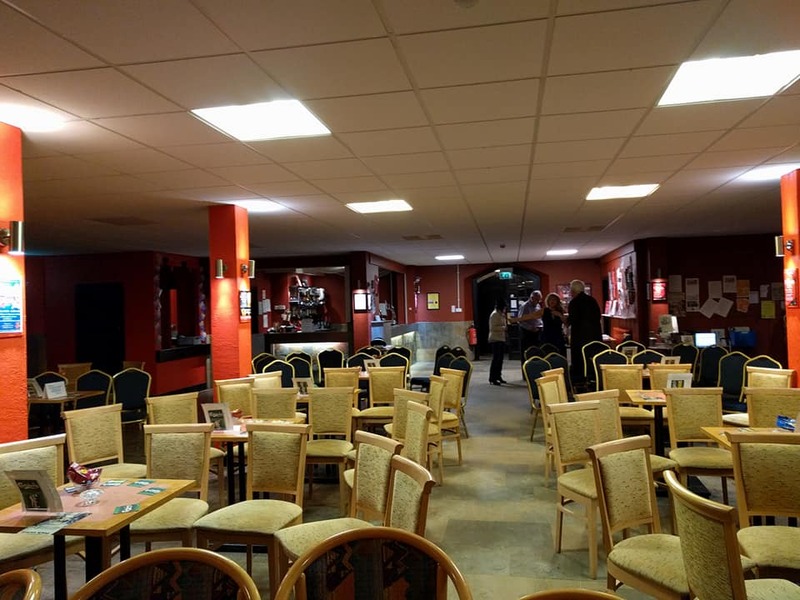 The gig itself was wonderful – it always is. The music gets more exciting the more I hear it and I seem to find new paths through the poems each time I perform them. Performing with the octet is exhilarating and I feel full immersion in the experience each time. There are particular phrases in the music that have a visceral effect on me and seem to reach into my words to draw out nuances and meanings that I didn’t know were there when I was writing. We returned home very briefly on Monday to repack the bag and then headed off to that London for the theatre; The Old Vic. Girl From The North Country is a brand new play by Conor McPherson based around the music of Bob Dylan and set in the Great Depression in 1934. I was nervous about it because I wanted to like it so badly and I knew reviews were mixed – I had only read one in advance which was positive and I put it out of my head so as to receive the production freshly. It’s been a while since I’ve been to the theatre and a long time since I’ve seen anything brand new. Loving Dylan as I do, I was praying that the music wouldn’t be cringe-worthy, belted out musical theatre renditions of the ‘greatest hits.’ I love musical theatre but have an aversion to jukebox musicals. I was transported, taken out of the world for a few short hours. Rarely do I finish watching a show and want to see it again immediately but I could have sat through it again, and again, and again. It is delicate, beautiful, sad beyond words and utterly human. See it if you can. Yesterday we got caught in the rain and didn’t care. We were both light and full of the treasures of the previous days. The best human suggested we wander and wonder without a plan. The downside of this was a light lunch that required a bank loan. The upside was stumbling into Tate Modern and finding Janet Cardiff’s Forty Part Motet sound installation. The best human had already experienced it in Liverpool and had wanted to share it with me and so finding this little gift from the universe was doubly wondrous as he had no idea it had moved to London. Using Thomas Tallis’ Spem In Alium, the sound installation features 40 speakers, each one playing a separate voice from the forty strong choir. The experience of hearing it in a darkened room is eerie and intensely beautiful. Holidays must end as you know sang Natalie Merchant in her beautiful song Verdi Cries. I always hear her singing that song in my head as I come home after time elsewhere. It’s in the back of my head now as I write. Homecoming is fine, it has to be. We got home to high winds and a feeling of madness in the air. Still, it’s never dull.